Call 561-746-4242 for an appointment today. Don't delay! Many Jupiter residents suffer debilitating pain from disc injuries in the neck and lower back. This pain is a very common reason for a poor quality of life, limitation of activity, and why most people consider surgical procedures to obtain relief. Non-Surgical Spinal Decompression is a revolutionary new technology that is used primarily to treat these disc injuries safely.This FDA-cleared equipment uses distractive forces in a precise and graduated manner. These distractive forces are then offset by periods of partial relaxation. 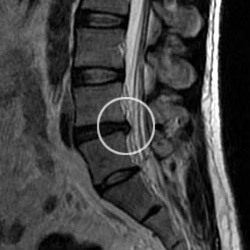 This technique of therapy has been shown to gently separate the vertebrae from each other, creating a vacuum inside the discs. This "vacuum effect" is known as negative intra-discal pressure. This negative pressure may induce the retraction of the herniated or bulging disc back into the inter-vertebral space, and thus removing it from irritating the nerve root and other pain-causing structures. It happens only microscopically each time, but cumulatively, over four to six weeks of treatment, the results are quite dramatic. These cycles of decompression and partial relaxation, over a series of visits, also promote the diffusion of water, oxygen, and other nutrient-rich fluids into the disc that can help the torn and degenerated disc fibers to begin healing. Call 561-746-4242 for an appointment today. Don't delay! Call to begin your road to recovery from this painful injury.